For those of you who have been following The Micro-Dwelling Project, you know that we’ve been working on the 100% DIY remodel of a tiny guesthouse on our property. We’ve been adding some final touches to the interior and as part of that want to introduce you to The adorne® Collection by Legrand by Legrand, which includes everything from light switches and outlets to under-cabinet lighting and a Bluetooth sound system. These additions to the guesthouse have added tremendously to both its appearance and functionality. Let me show you what we did and what we love about these products. First we started with the outlets, wall plates and light switches. There are so many awesome and innovative options to choose from. We selected a few and, to complement the overall look of the guesthouse, we went with the color white. 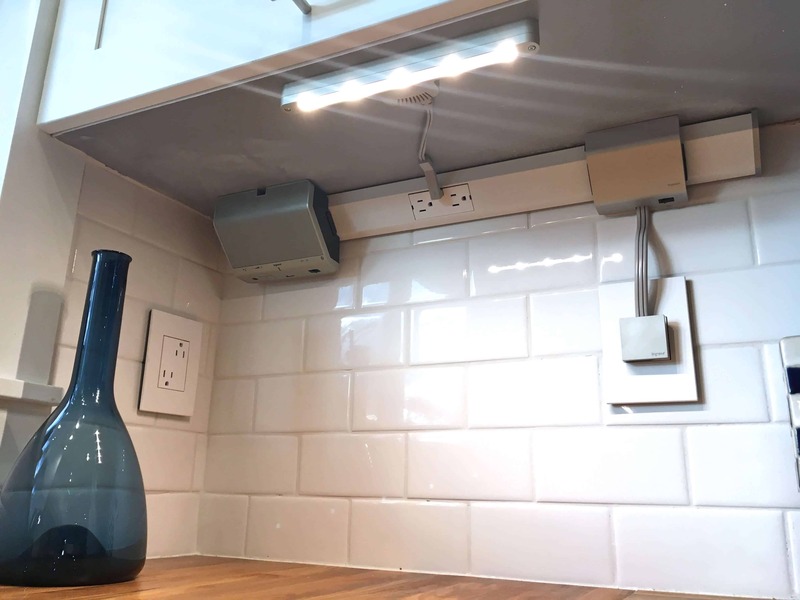 Installation of both the adorne® outlets and Under-Cabinet Lighting & Power System (more on that below) was a breeze and requires very minimal skill. Within 3 hours we had multiple outlets, switches and the entire under-cabinet lighting system installed. Here’s a peek at some of the Adorne outlets and switches we installed in our guesthouse. The The adorne® Pop-Out Outlet is totally ingenious. It takes up the same space as a single outlet but serves as three. Pop it out when you want to plug in multiple items and then push it in to hide it when it’s not in use. Another thing we love about it is that if you have young children, the outlets are also tamper-resistant. We chose the Powder White 1-Gang Wall Plate to go with it. The Paddle Switches and accompanying 3-gang wall plates we chose are downright awesome. 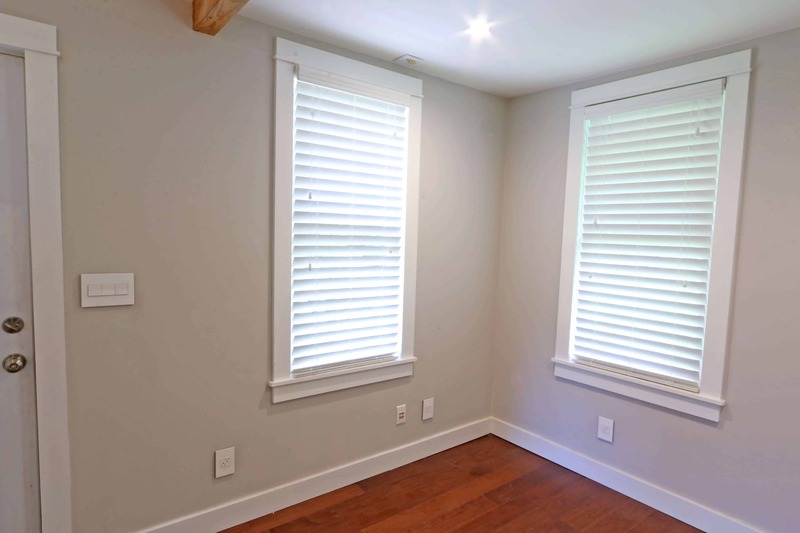 They have a very Euro-style appearance which really enhance the overall look of the room. And just pushing the buttons you can feel how high of quality they are. The positioning of the adorne® Plus Size Outlets is terrific because it allows you to plug in two oversized plugs into the same outlet. Plus they just look very cool! We used the corresponding 1-Gang+ Wall Plate for the outlet. 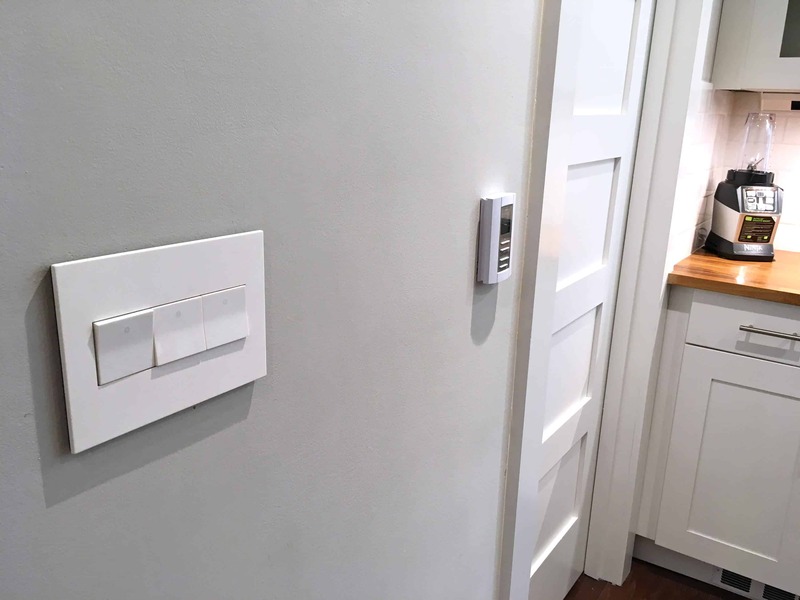 For the particular look we wanted for our guesthouse, we chose white light switches, outlets and wall plates. But The adorne® Collection has a look for everything and their selection is incredible! As an example, they have over 35 different finishes of wall plates, including vivid hues, cast metals and other real materials like wood and leather! 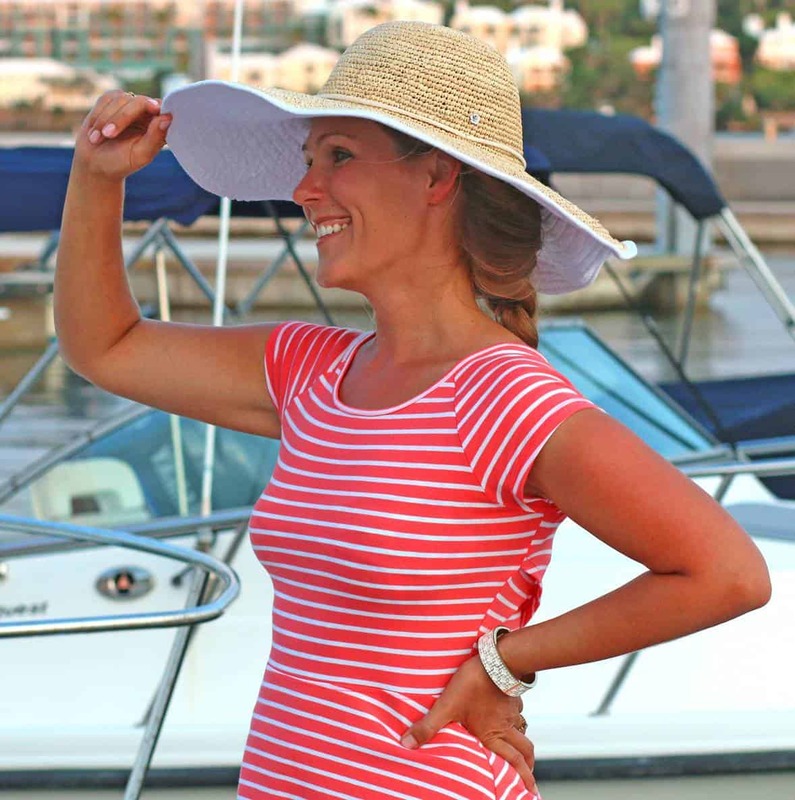 Whatever look you’re going for, The adorne® Collection likely has it. We also equipped our guesthouse kitchen with some terrific products from The adorne® Collection. The adorne® Collection Under-Cabinet Lighting & Power System is perfect for anyone wanting to enhance both the appearance and functionality of their kitchen. It not only provides great lighting, it provides additional outlets, USB plugs, charging cradles for tablets and smartphones, and a Bluetooth sound system for your entertainment. In short, it adds aesthetics, ease and convenience to your everyday cooking routine. 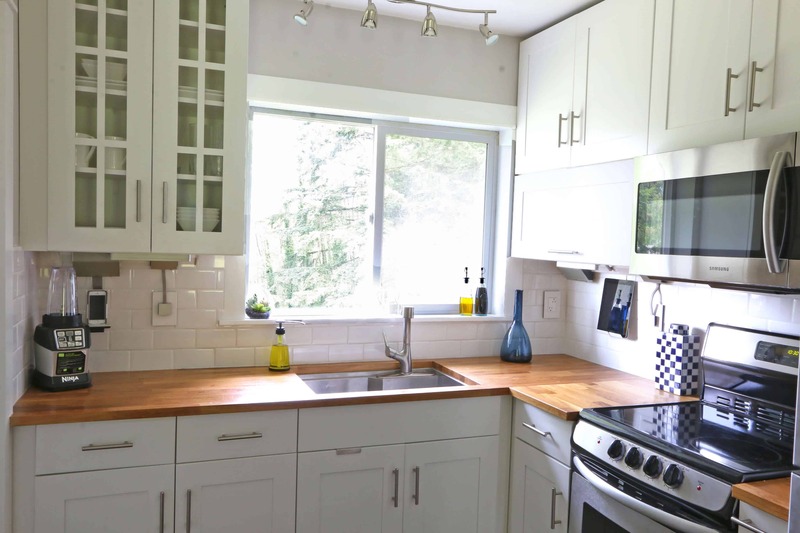 Here’s the micro-kitchen in our micro-guesthouse right after our DIY remodel and before we upgraded to the adorne® outlets, switches and added the Under-Cabinet Lighting & Power System. As I guide you through the adorne® products we chose you’ll see how much they also enhanced the aesthetics of the kitchen. It looks even sleeker now with a more upscale feel. Installing the LED Linear Lights was an absolute breeze. A control box plugs into an existing outlet and provides power to the lights and other accessories that plug into the Modular Track. The modular track is installed under the cabinets back against the wall. We got an 18-inch track for one side and 27-inch track for the other. (You can also get USB Outlet Modules that plug into the modular track, which is a great option to have.) 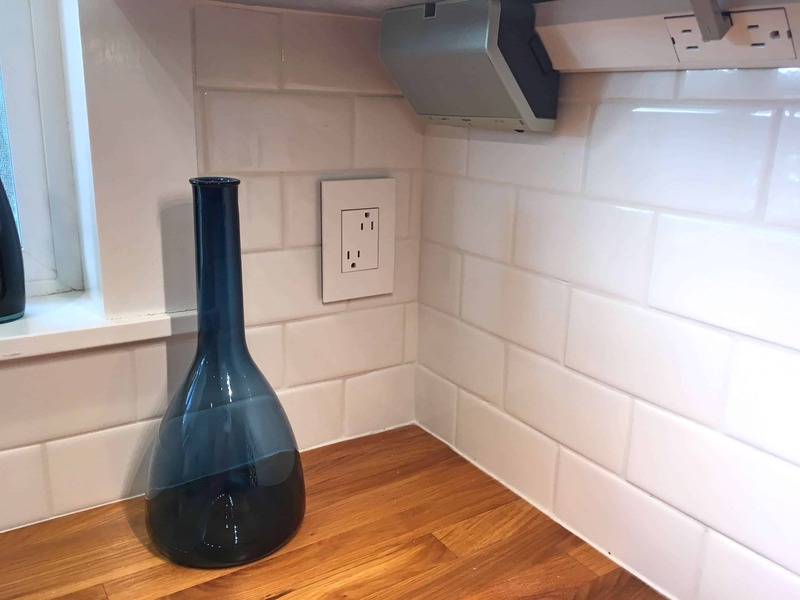 Adorne has a hard-wired control box that doesn’t use up an outlet and makes for a cleaner look, but we chose the Plug-In Control Box since our kitchen wiring was already completed and we didn’t want to tear open the tiled walls. We also used LED Light Extenders so the lights under each set of cabinets could reach back to the Modular Track. The modular tracks can be expanded depending on how much cabinet space you have and they can also go around corners. 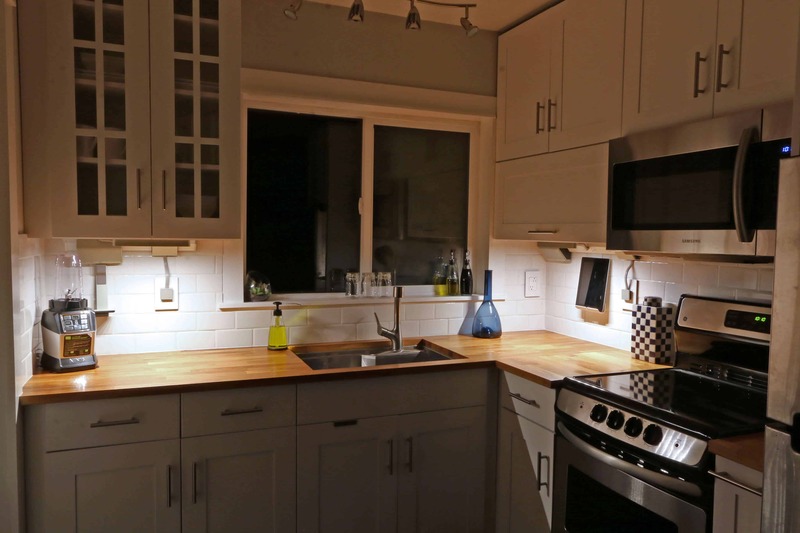 The under-cabinet lights provide such a great ambience both in the late afternoon and at night. Sitting in the adjoining living room of this guesthouse, no other lighting is needed to enjoy a comfortable atmosphere to relax and unwind. Next we added the Digital Music Kit. The installation took less than 5 minutes – the speakers simply plug into the Modular Track under the cabinets. And if you want to remove them, they pop right out. The Digital Music Kit comes with two speakers and we installed them on either side of the kitchen for a full stereo sound. Nothing beats listening to your favorite music while you’re cooking! What we love about this sound system is that it’s mounted under the cabinets which means they don’t take up any space, they don’t clutter your countertops, and they’re completely out of your way. The Digital Music Kit also comes with a detachable dock for smartphones and MP3 players that will charge the devices while you’re listening to your favorite music or podcasts. The music kit features Bluetooth technology to enable wireless streaming from your device. And if you want to use a non-wireless device, the system includes 3.5 mm. You can charge your phone while listening to your favorite playlists and again, it takes up no counter space an no additional outlets – it simply attaches directly to the speaker. Another really cool adorne® accessory is the Tablet Cradle. It can be attached and unattached from the Modular Track under the kitchen cabinets. 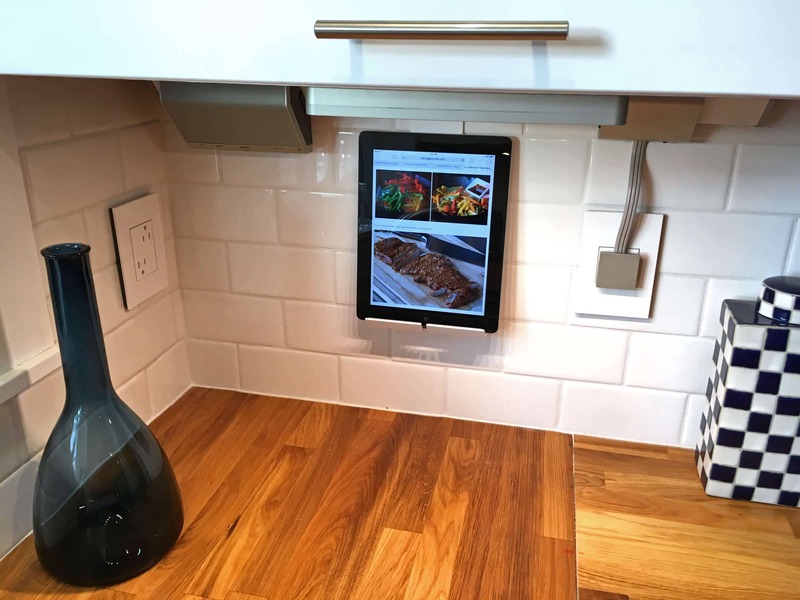 You can dock your tablet there and charge it and it’s perfect for using it to follow recipes as you cook. 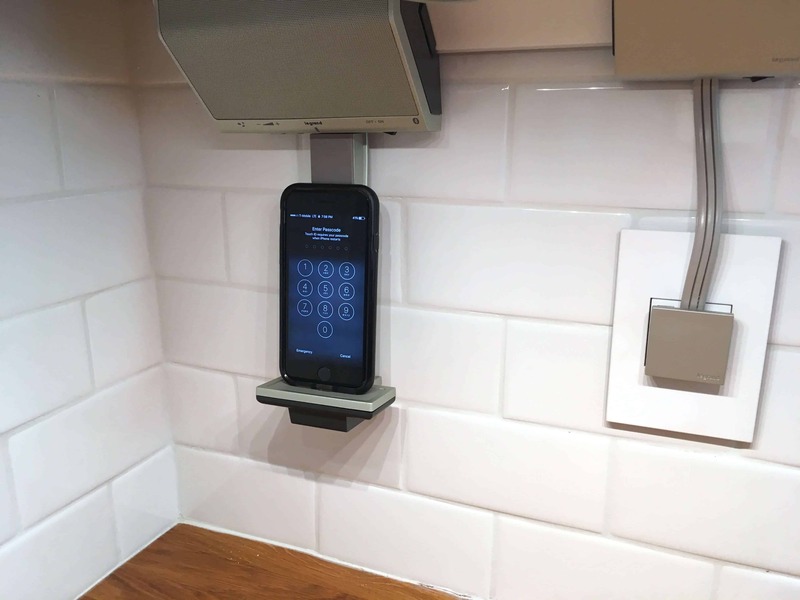 Instead of having to set the tablet down on the counter, getting in the way of your prep space, you can set it in the tablet dock where it’s not only out of your way, but is positioned ideally for being able to view it while you’re cooking. 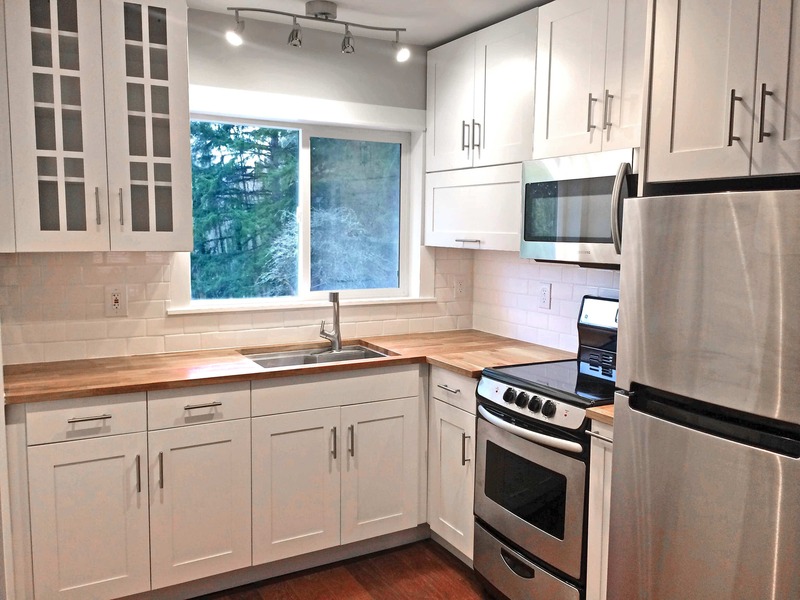 In the case of this guesthouse kitchen, we installed it right next to the cooktop for easy reference while cooking. Not only is it super functional, adding ease and convenience to your cooking routine, it also adds an awesome aesthetic element to the appearance of a contemporary kitchen, as do all of the adorne® products. 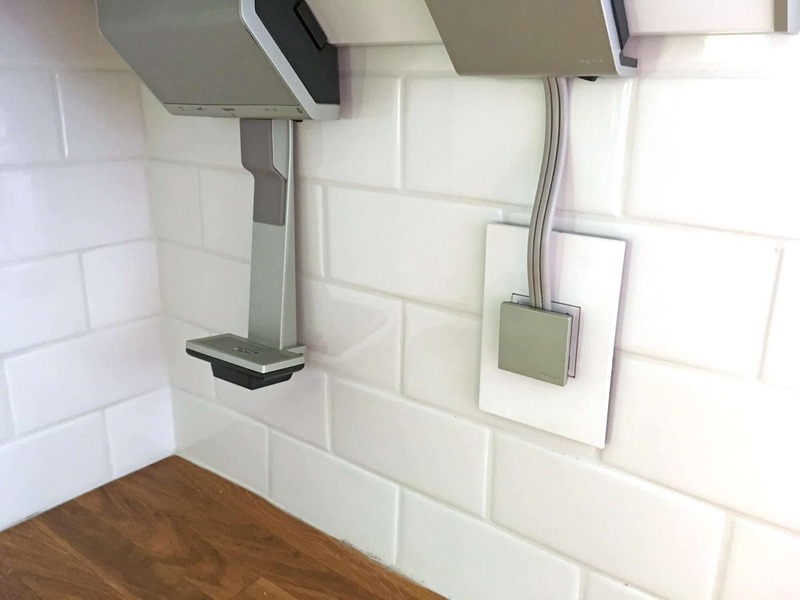 Visually, the adorne® outlets and wall plates, the under-cabinet lighting, outlet strips, sound system, smartphone and tablet docking stations all add to the sleek, clean and contemporary look of the kitchen. We LOVE these adorne® products! Bottom line: For anyone wanting to enhance both the appearance and functionality of their kitchen, the adorne® Under-Cabinet Lighting & Power System is the perfect choice. In addition to great lighting it also provides a Bluetooth sound system, additional outlets, USB plugs and charging cradles for your devices. With an incredible selection of innovative switches, outlets and wall plates, The adorne® Collection is also the perfect choice if you want to upgrade your home with the latest technology and give your home a more upscale appearance. Verdict: We love all of our products from The adorne® Collection! They’ve really enhanced both the appearance and functionality of our guesthouse. We’re getting ready to remodel our main kitchen later this summer and cannot wait to equip it with The adorne® Collection! 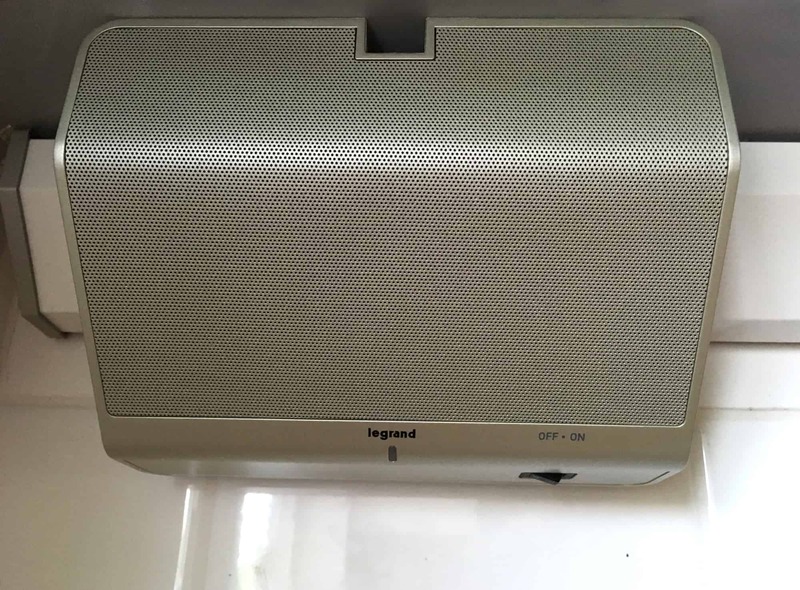 Disclosure: Thank you to Legrand for sponsoring this post! As always, this is an honest review and all opinions are entirely my own. All of the plugs look so sleek and high tech! Love them! This remodel is so amazing! I love that Digital Music Kit! The place looks great. Clean and shiny! Loooove your outlets, switches and lighting from Adorne!! Love the contemporary feel of them all. Will look into them, thanks. LOVE these and I need them! What a difference in the look! So sleek! That is looking so good! I love that music kit! Everything looks beautiful and that kitchen looks amazing! I’m just starting to work on a remodel of my studio and this post is great. It looks beautiful! I need that tablet cradle!! Wow, everything looks so modern and beautiful! I am absolutely keeping these in mind for when I get my dream kitchen. They are fantastic. WOW! 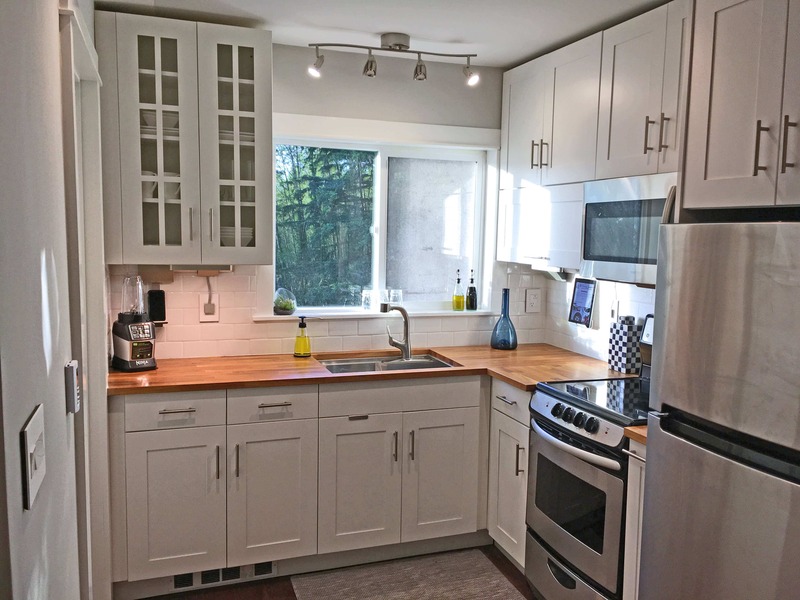 I’ve been following the whole remodel and I agree, as gorgeous as the kitchen was before, these upgrades make it look even more terrific. LOVE the switches and wall plates, NEED that undercabinet lighting, and the music kit is just plain awesome! 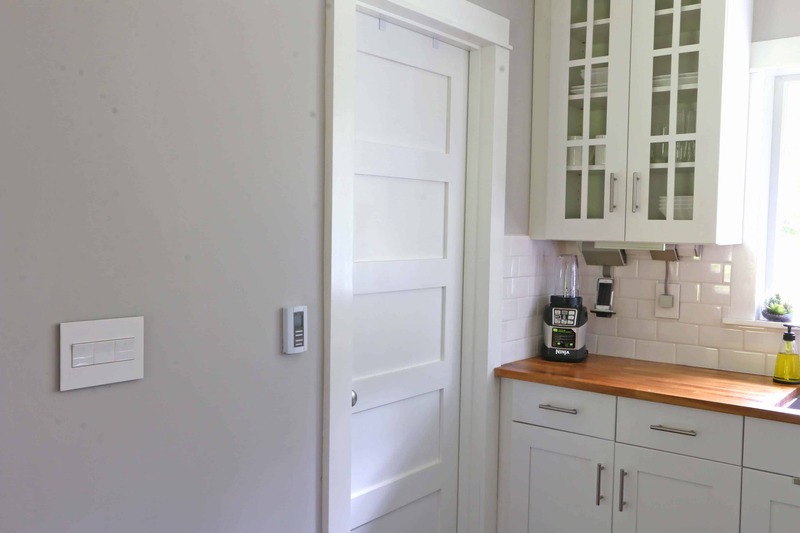 I love those switches and outlets and am totally digging music kit in the kitchen! The ipad cradle is perfect for looking at recipes while cooking, love it. Gorgeous! You have done such a gorgeous job with this space! And now, I really want the music station and iPhone and tablet docks – genius! Wow! It looks amazing! Blood, sweat, tears, love and amazing planning – you can see it! Love the music doc and the outlets are so smart! Thank you, Sandra. A little English cottage with an English garden sounds absolutely delightful! I wish you all the best with your upcoming project. This is amazing, great job! Did you ever do a final reveal of the whole place? I just read all 9 installments and I’m dying to see the total finished product!